I travel all over the place teaching Git to people and nearly every class and workshop I’ve done recently has asked me what I think about git-flow. I always answer that I think that it’s great - it has taken a system (Git) that has a million possible workflows and documented a well tested, flexible workflow that works for lots of developers in a fairly straightforward manner. It has become something of a standard so that developers can move between projects or companies and be familiar with this standardized workflow. However, it does have its issues. I have heard a number of opinions from people along the lines of not liking that new feature branches are started off of develop rather than master, or the way it handles hotfixes, but those are fairly minor. One of the bigger issues for me is that it’s more complicated than I think most developers and development teams actually require. It’s complicated enough that a big helper script was developed to help enforce the flow. Though this is cool, the issue is that it cannot be enforced in a Git GUI, only on the command line, so the only people who have to learn the complex workflow really well, because they have to do all the steps manually, are the same people who aren’t comfortable with the system enough to use it from the command line. This can be a huge problem. Both of these issues can be solved easily just by having a much more simplified process. 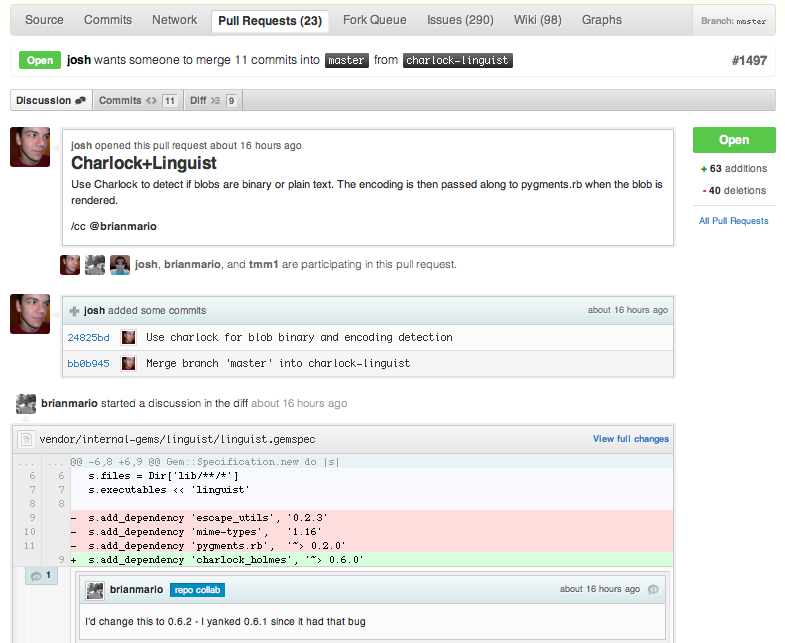 At GitHub, we do not use git-flow. We use, and always have used, a much simpler Git workflow. Another advantage of deploying all the time is the ability to quickly address issues of all kinds. We can respond to security issues that are brought to our attention or implement small but interesting feature requests incredibly quickly, yet we can use the exact same process to address those changes as we do to handle normal or even large feature development. It’s all the same process and it’s all very simple. 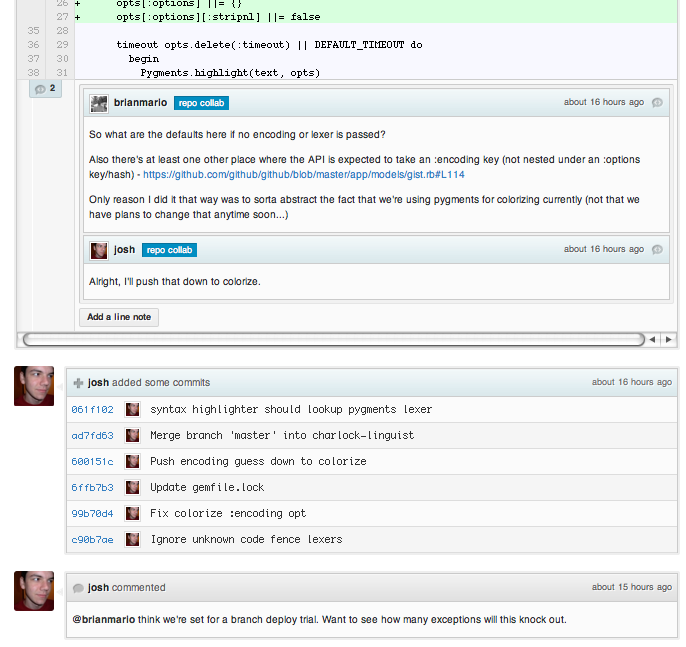 So, what is GitHub Flow? That is the entire flow. It is very simple, very effective and works for fairly large teams - GitHub is 35 employees now, maybe 15-20 of whom work on the same project (github.com) at the same time. I think that most development teams - groups that work on the same logical code at the same time which could produce conflicts - are around this size or smaller. Especially those that are progressive enough to be doing rapid and consistent deployments. This is basically the only hard rule of the system. There is only one branch that has any specific and consistent meaning and we named it master. To us, this means that it has been deployed or at the worst will be deployed within hours. It’s incredibly rare that this gets rewound (the branch is moved back to an older commit to revert work) - if there is an issue, commits will be reverted or new commits will be introduced that fixes the issue, but the branch itself is almost never rolled back. The master branch is stable and it is always, always safe to deploy from it or create new branches off of it. If you push something to master that is not tested or breaks the build, you break the social contract of the development team and you normally feel pretty bad about it. Every branch we push has tests run on it and reported into the chat room, so if you haven’t run them locally, you can simply push to a topic branch (even a branch with a single commit) on the server and wait for Jenkins to tell you if it passes everything. You could have a deployed branch that is updated only when you deploy, but we don’t do that. We simply expose the currently deployed SHA through the webapp itself and curl it if we need a comparison made. When you want to start work on anything, you create a descriptively named branch off of the stable master branch. Some examples in the GitHub codebase right now would be user-content-cache-key, submodules-init-task or redis2-transition. 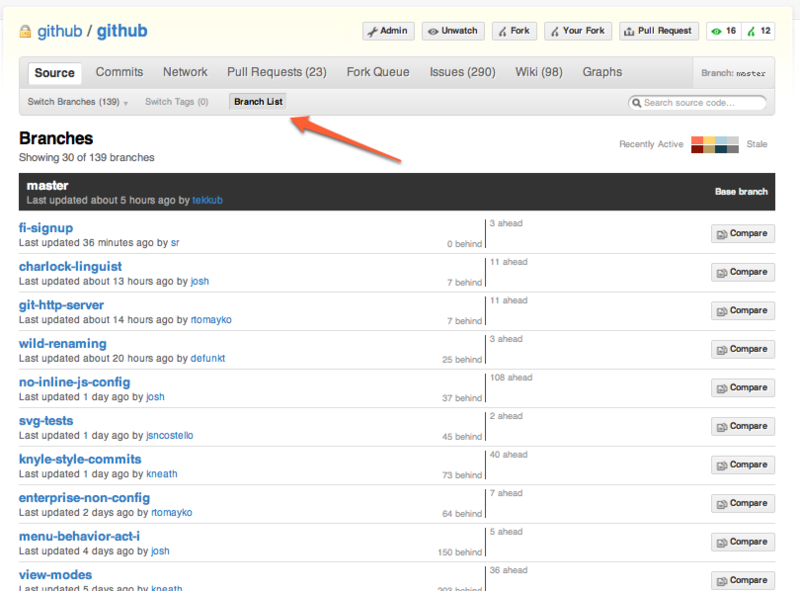 This has several advantages - one is that when you fetch, you can see the topics that everyone else has been working on. Another is that if you abandon a branch for a while and go back to it later, it’s fairly easy to remember what it was. This is nice because when we go to the GitHub branch list page we can easily see what branches have been worked on recently and roughly how much work they have on them. It’s almost like a list of upcoming features with current rough status. This page is awesome if you’re not using it - it only shows you branches that have unique work on them relative to your currently selected branch and it sorts them so that the ones most recently worked on are at the top. If I get really curious, I can click on the ‘Compare’ button to see what the actual unified diff and commit list is that is unique to that branch. So, as of this writing, we have 44 branches in our repository with unmerged work in them, but I can also see that only about 9 or 10 of them have been pushed to in the last week. 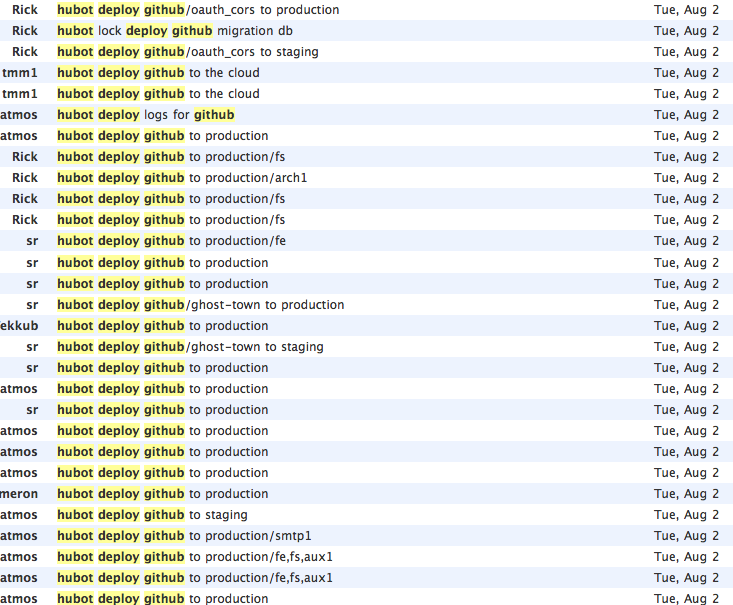 Another big difference from git-flow is that we push to named branches on the server constantly. Since the only thing we really have to worry about is master from a deployment standpoint, pushing to the server doesn’t mess anyone up or confuse things - everything that is not master is simply something being worked on. It also make sure that our work is always backed up in case of laptop loss or hard drive failure. More importantly, it puts everyone in constant communication. 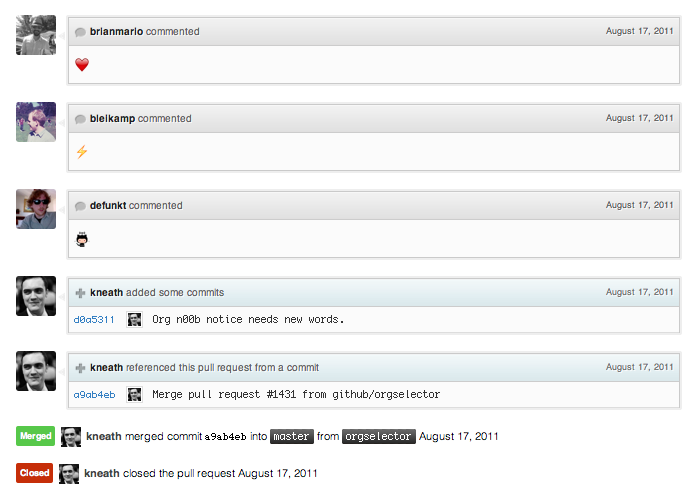 A simple ‘git fetch’ will basically give you a TODO list of what every is currently working on. If the branch has been open for too long and you feel it’s getting out of sync with the master branch, you can merge master into your topic branch and keep going. You can easily see in the pull request discussion or commit list when the branch was last brought up to date with the ‘master’. We don’t simply do work directly on master or work on a topic branch and merge it in when we think it’s done - we try to get signoff from someone else in the company. This is generally a +1 or emoji or “:shipit:” comment, but we try to get someone else to look at it.